Once upon a time, there was the small wind business, and the commercial-scale industry. As wind energy has grown over the decades this simple dichotomy has evolved into how the wind turbines are used instead of their size alone. Today, the US Department of Energy (DOE) talks about “distributed generation” while in Britain the defunct Depart of Environment and Climate Change (DECC) referred to “microgeneration.” In both cases these are wind turbines of varying size connected to the distribution system or installed behind the meter. DOE reports that nearly 1,000 MW of wind generating capacity were operating in distributed applications across the United States through 2014, the most recent year for which there are records. This includes small, medium, and large wind turbines. The total installed wind-generating capacity in the United States for the same period was 66,000 MW. 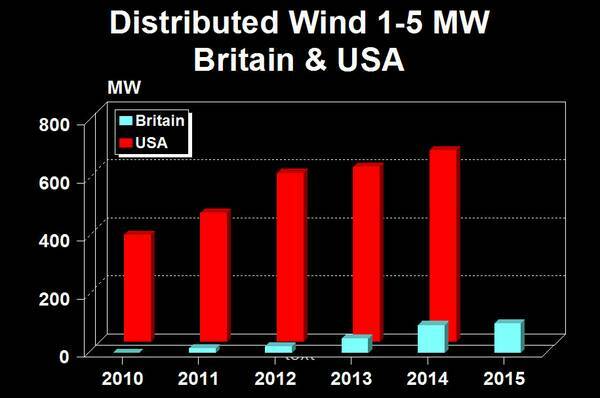 Britain, with one-fifth the population of the USA, installed 560 MW of wind generating capacity in distributed applications from 2010 through 2015. 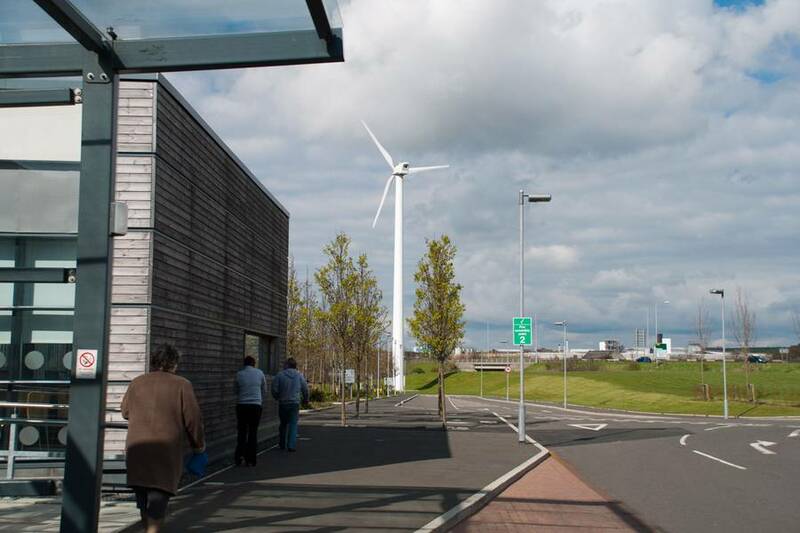 This represents more than three times the MW per capita installed through Britain’s microgeneration program than the distributed capacity installed in the United States. The total installed wind-generating capacity throughout Britain was about 14,000 MW through 2015. The British microgeneration program includes small, medium, and large wind turbines. When the program was launched in 2010, it included Feed-in Tariffs (FITs) for six different classes of wind turbines. The same tariffs were paid nationwide, regardless of where the wind turbines were located—whether in Scotland, Northern Ireland, or England. Later, three of the small wind turbine tranches were combined into one, though DECC continues to report all size classes. In contrast, there is no national distributed wind energy program in the United States. Payment for wind generation or rules governing how and when a wind turbine can be used behind the meter varies from state to state. Instead of FITs, the federal government supports small wind turbines and distributed applications through a 30% tax credit or capital grants. Of the wind capacity installed under Britain’s microgeneration program, 23% was derived from wind turbines less than 100 kW in size. From the 9 MW installed in 2010, installations grew rapidly under the microgeneration program to reach nearly 130 MW in 2015. US installations for the same size class increased modestly from a higher base (90 MW) to 140 MW in 2014. 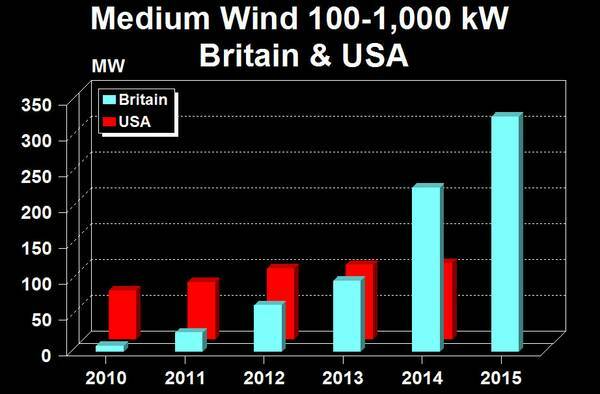 On a per capita basis, Britain’s microgeneration program installed four times more wind generation capacity less than 100 kW in size than the United States during the brief life of the British program. 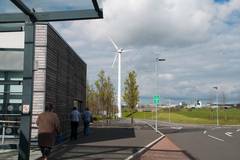 58% of the total capacity in the British program was from medium-size wind turbines 100 kW to 1,000 kW. The growth in this market segment in Britain was even more dramatic relative to that in the United States. Through 2015, Britain’s microgeneration program installed 328 MW of medium-size wind turbine capacity, relative to some 110 MW installed through 2014 in the United States. One of the turbines in this size class is represented by the 800 kW Enercon turbine installed in 2016 at the headquarters of Royal Society for the Protection of Birds in central England. Distributed wind installations in the United States for the large turbine class from 1 MW to 5 MW far exceeded that in Britain both in absolute terms and per capita. US installations through 2014 reached 660 MW. 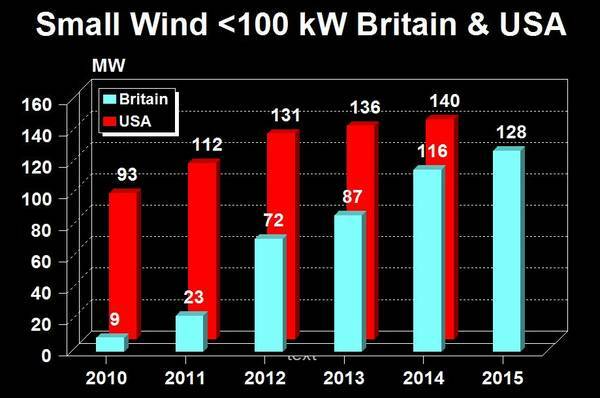 Britain installed 110 MW through 2015. With increasing political uncertainty in Britain (a new Prime Minister, the abolition of DECC, and Brexit) it’s not clear whether the microgeneration program will continue and if it does in what form. Several small wind turbine manufacturers have already collapsed as the FIT rates have been steadily reduced. Similarly, there’s increasing political uncertainty in the United States as well. The subsidy for small wind turbines will expire this year. If a new government antithetical to renewable energy comes to power it’s doubtful that the subsidy will be extended. While the subsidy for larger wind turbines is being phased out gradually, programs that allow distributed wind turbines to be installed and that determine how much they will be paid for their electricity have been the subject of frequent and well-funded attacks. These could further restrict the growth of medium-size and large wind turbines in distributed applications in the United States. Of course there’s always the possibility that Theresa May, the new British Prime Minister, will cancel EDF’s Hinkley Point C reactors and launch an aggressive new renewable energy program. And on this side of the Atlantic, Congress could be swept by a desire to finally take action on climate change and reward the American people for their patience.